Microsoft and Facebook have announced plans to roll out a subsea cable infrastructure connecting the US and Spain, as the latter continues to make a physical network infrastructure play. Not content with the ability of third party-owned infrastructure to provide next-generation connectivity for their services; both players, which made their name in software, are making the leap to physical network deployment. 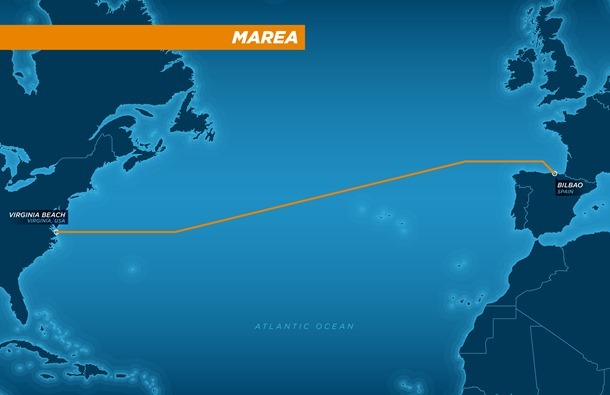 MAREA, Spanish for ‘tide’, will run from North Virginia in the US to Bilbao in the north of Spain, which will apparently provide more reliable and resilient connectivity for customers in southern Europe. With capacity of 160Tbps, Microsoft claims the infrastructure will be the highest-capacity subsea cable to ever cross the Atlantic, utilising eight fibre pairs to achieve its stated capacity. Telefónica subsidiary Telxius, a specialist submarine cable infrastructure operator, will be managing the network. The plan is for MAREA to extend beyond Spain and in to network hubs across Europe, Africa, the Middle East and Asia. The move marks another shift towards hardware by traditional internet-based companies. While Microsoft cites the partnership as an enablement platform for greater Azure coverage and service continuity; Facebook’s contribution adds further momentum to its network infrastructure play. Earlier this year, Facebook announced its Terragraph infrastructure project, which is an urban wireless initiative using the unlicensed 60GHz band, based on the WiGig standard. Facebook aims to create a high-speed urban mesh network using Terragraph and its complementary Massive MIMO project Aries, which it says will use a mass of antennae and base stations to maximise spectral and energy efficiency. It wants to see how far it can push Massive MIMO, and referenced 5G in its announcement as the era in which this project will be most suited. Essentially, Facebook is making a wireless play. The blue-thumbed digital friendship platform, however, is doing so with open technology and standards in a way which could, ostensibly, benefit the wider mobile ecosystem. Coupled with today’s MAREA announcement, Facebook’s infrastructure intentions are becoming pretty clear: it doesn’t want to be reliant on third party networks to deliver its services. The Facebook VP of Network Engineering, Najam Ahmad, hinted at this future independence when discussing the announcement. Work on MAREA is expected to begin in August this year, with completion anticipated around October 2017. Here’s a handy map of the route.